The term francophonies appeared for the first time around 1880, when a French geographer, Onesime Reclus, used it to refer to all persons and countries speaking French. It is time to put this term back into fashion! And for that, what can be better than adapting it to the universe of My Little Pony? Let us drop the "h" and speak now of Francoponies. 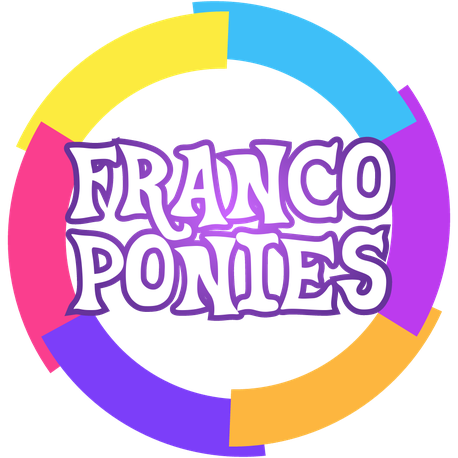 Francoponies is a group of active french websites dealing with the brands My Little Pony: Friendship is Magic and Equestria Girls. This relational group aims to boost exchanges between webites and help each others in actions. Francoponies includes the streaming webites MLPFrance and Need For Ponies, the meet-up listing Bronies.fr, the news websites MLP Québec, MLPRainbow and Le Poney Blanc, the role play forum My Little Equestria, the event organizers OzONe, the Minecraft server Cube of Harmony and the Mastodon instance Equestria.Social as well as the comics website Canterlot Comics. The objective of each website is to provide to its viewers the best service in its field. Between chitchat, questions for the websites and events, you can find all of these websites on the Discord of the Francoponies. 1245 people visit the site in the last 24 hours, and 0 on this page (refresh at least one time per hour).